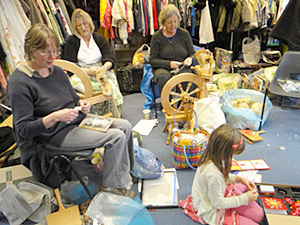 The Brighton Spinning Group continues to meet each Friday afternoon at The Green Centre in Manor Road in East Brighton. 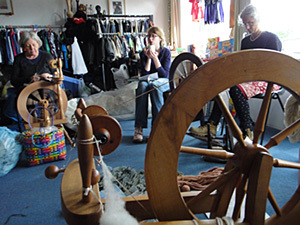 We have three spinning wheels and a number of drop spindles and although we're a self-help group, there is usually someone around who can show newcomers the basics of spinning. Our big news this month HAS to be the Brighton Mini Maker Faire (see below) as a result of which we have another new recruit - welcome aboard, Rachel. 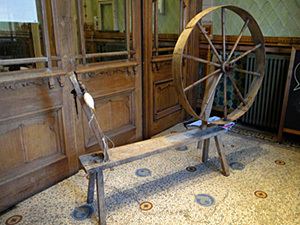 And this is our newest spinning wheel that, thanks to the East Susex Guild, we picked up this week from the Battle Wool Shop. We had SO much to discuss this week that we had to have an agenda and take notes. Can you believe it? 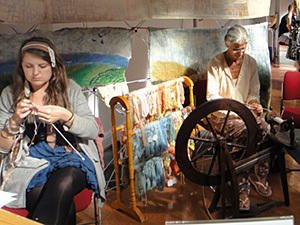 At the amazing Brighton Mini Maker Faire we not only displayed our maps and dyed wool samples, but demonstrated spinning on our Ashford wheel thanks to Jane (with a little help from me), whilst Ann showed off her enormous skill on the Great Wheel. 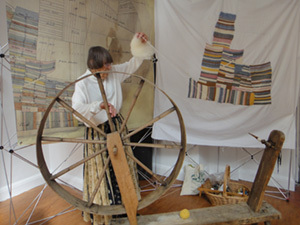 ...where I have to say I think the wheel looked fantastic and was something of a draw (spinning pun intended) for visitors to our exhibition. (Apparently there were nearly 7,000). 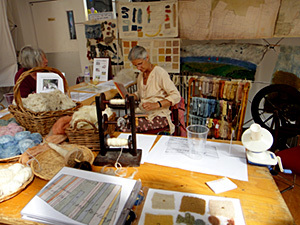 Jane, too, spent most of her day carding and spinning more fleece, judging by how much yarn we used today, we're going to need to dye quite a lot more. This week I made it back to Buxted for the first time in almost a year. It was great to see everyone and admire their new home in the Reading Room. 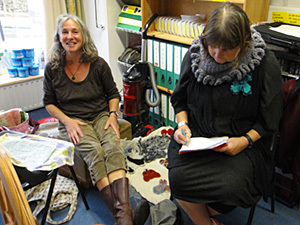 Sadly we didn't manage to knit and spin in the Yurt on The Level last week after all. The awful weather meant that the ground was simply too wet for us to erect our space. Ann was SO absorbed in her spinning and winding at the BMMF that I'm not sure she ever noticed the dalek that passed by every now and then.